The statute contains the following provision regarding administrative expenses (emphasis added): “In determining the monthly premiums for the CLASS program the Secretary may factor in costs for administering the program, not to exceed … an amount equal to 3 percent of all premiums paid during the year.”39 Expenses for protection and advocacy services and advice and assistance counseling are counted as administrative expenses40. It is our opinion that there is no explicit restriction on the actual administrative expenses. Other than the initial roll-out, there is no guarantee of additional federal funding in support of these services. It would be unrealistic and undesirable to limit actual administrative expenses to only 3% of premiums (see our estimate below). Such a limitation would allow for little or no advocacy services or advocacy and assistance counseling. Claim payments might not be made on time. Enrollment might have to be curtailed. Experience monitoring might not be done to ensure timely premium adjustments in order to maintain solvency. Fraud and abuse prevention and monitoring might be limited or non-existent. These events would adversely affect the integrity and ultimate existence of the Program. There is an important distinction between expense assumption in the premium development and actual future expenses which are not guaranteed to be realized. The process of determining premiums involves making assumptions regarding future claims, investment returns, persistency, as well as expenses. None of these assumptions can be guaranteed to hold during the lifetime of the enrollees in the Program. In order for the plan to be actuarially sound and the Program to be sustainable, these assumptions must be realistic. In selecting these assumptions, we anticipate that favorable experience for one of these factors may offset unfavorable experience for another such that the plan is overall actuarially sound. For example, favorable claim experience can offset unfavorable investment experience, leaving the Program actuarially sound overall. The statutory provision may necessitate choosing assumptions that are expected to be reasonable in the aggregate, with some conservative margin incorporated into the other assumptions to compensate for the aggressive 3% expense assumption. These expenses are derived from a survey of the pricing expense assumptions of group long-term care insurance and experience from the Federal Long Term Care Insurance Program. We expect that these expenses will rise according to the CPI. Because certain components of these costs are fixed or not a function of premiums, these percentages reflect the relatively low estimated average premium (under $1,000 annual premium) compared to other forms of insurance (for example, health insurance). 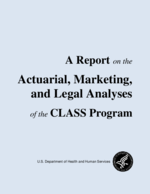 Thus metrics from other insurance are not always directly transferrable to the CLASS Program. The statute is silent on the use of investment returns from the trust fund. Because premiums collected are expected to exceed benefits and expenses in the early years, we expect considerable build-up of the balance in the trust fund. Investment returns from the trust fund are a source of revenue in addition to premiums. This revenue can be used to cover expenses. expenses by vary by premiums. Compared to this simplistic assumption based on premiums alone, this approach will minimize the likelihood of actual expenses exceeding expected expenses due to incorrect estimation of the average premium per enrollee.